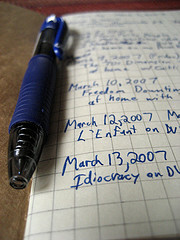 Putting down plans, notes, ideas, and hunches in a notebook can be a great way to help organize your mind, as well as sharpen it. We tend to remember things jotted down by hand better than words hammered on a keyboard. I love paper in all its forms and always have. In fact, if given the choice between a notebook and a web app to fulfill the same function, I’ll choose a notebook every time. Task management my way – pen and paper. Note: Photo by Chris Campbell. Posted on February 26, 2008 by BengtPosted in Bits and piecesTagged Write.